operation that specialized in skin care products. After many years of skin care research and development, Dr. Morita took product development further by setting up a research center in Japan. Dr. Morita sheet masks with premium ingredients were developed in this facility in the year 2000, more than a decade before sheet masks were considered trendy! Today, Dr. Morita is one brand under the umbrella of Dr. Jou Biotech headquartered in Taiwan. It has offices in Japan, Shanghai, and Hong Kong, with products available in Singapore, Malaysia, Vietnam, Thailand, and now, the Philippines! Partnering with Gentro International Products, Inc., Dr. Award-winning and best-selling, Dr. Morita Hyaluronic Acid Essence Mask ensures lasting moisture is delivered to the skin with Hyaluronic Acid and Collagen imported from Japan. Apart from hydrating the skin with three different sizes of Hyaluronic Acid molecules, it also soothes and promotes skin repair with Cucumber Extract, Marine Collagen, Ceramide, and Niacinamide. This makes a great anti-aging option for all skin types, including those with sensitive skin. Dr. Morita Intense Hydrating Serum Facial Mask sustains long-lasting skin moisturization afforded by Japanese Hyaluronic Acid and Amino Acids. Hydration is delivered efficiently to the different layers of the skin thanks to large, medium, and small Hyaluronic Acid molecules. This makes sure even dry skin types get the moisture it needs for a longer time. It also contains skin-caring Niacinamide, Allantoin, Squalane, and Ceramides. Get multiple skin care benefits with Dr. Morita Triple Hyaluronic Acid Moisturizing Essence Facial Mask. Its large, medium and small Hyaluronic Acid molecules deliver lasting hydration to all layers of the skin. It’s also a great anti-aging and brightening treat for your skin. Among its 11 Amino Acids are Arginine, which brightens skin by repairing visible skin damage, and Glycine and Proline which help smooth fine lines and wrinkles. 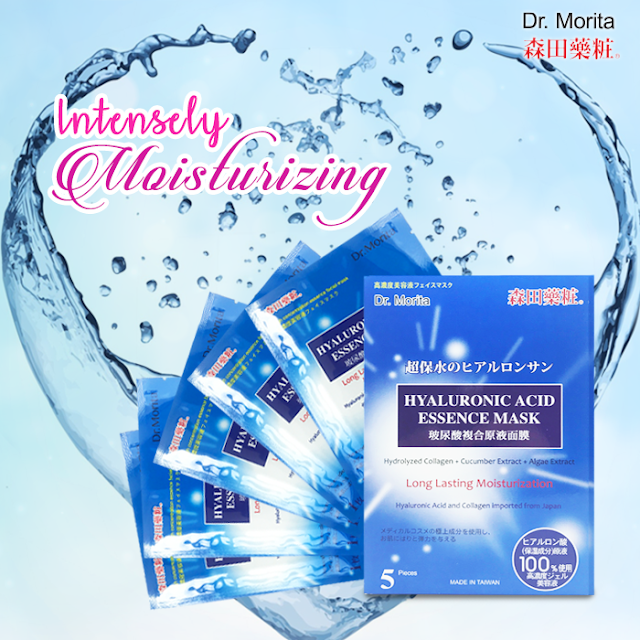 Dr. Morita Whitening & Moisturizing Essence Facial Mask makes it possible to whiten your skin without drying it out! Hydrating Japanese Hyaluronic Acid combines with Mandelic Acid from Merck Germany, one of the leading pharmaceutical groups in worldwide. Mandelic Acid is one of the gentler Alpha Hydroxy Acids (AHA’s) around, making it a great option for easily sensitized skin. This also contains various plant, flower, and root extracts to soothe, hydrate, and brighten skin. Looking for something new? Try Dr. Morita Platinum Colloid & Hematite Extraction Whitening Black Facial Mask. Japanese Tranexamic Acid and multiple herb extracts whiten while Hyaluronic Acid gives deep hydration. Treat your skin to Iron-rich Hematite and Obsidian Extracts, known to have toning, regenerating, and strengthening properties. Antioxidant-rich Platinum Colloid helps your skin fight aging. Give your face a luxury treatment with Dr. Morita Platinum Colloid &amp; Black Pearl Extraction Moisturizing & Whitening Black Facial Mask. Hyaluronic Acid hydrates while Platinum Colloid’s antioxidant content prevents skin from premature aging. Black Pearl Extract has been part of ancient Chinese medicine and skin care for good reason: calcium-rich pearl powder has been known to help detoxify, promote cell renewal, and enhance skin elasticity. Care for your skin while getting whitening benefits from Tranexamic Acid and multiple herb extracts. serum or cream, if so desired. Hurray for one-step skin care! face and neck the next morning or night. “reverse osmosis,” leaving your skin drier than the ideal. ● Going on a trip? Sheet masks are a great travel-friendly skin care option! ● Consider using a sheet mask daily for better results. Help us share the good news! Please use the hashtags #drmoritaph and #drmoritasheetmasks as you spread the love for Dr. Morita sheet masks on social media. Like Dr. Jou Philippines on Facebook, and follow @drmoritaph on Instagram to get the latest on Dr. Morita products. Dr. Morita sheet masks are now available at Watsons and SM Beauty for only P74.00 each. Dr. Morita products are distributed locally by Gentro International Products, Inc.